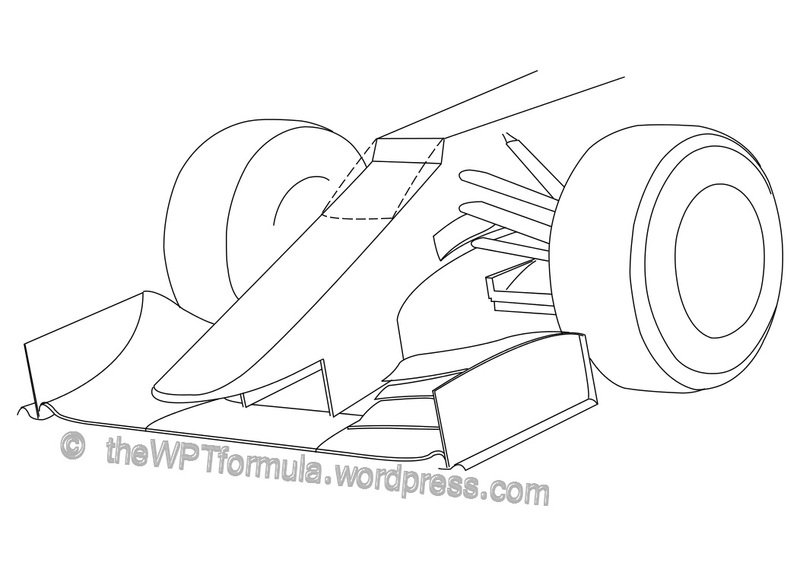 The above image shows what the front wing will look like relative to the current wing (dashed lines). One debate that has cropped up on forums lately has been the idea of reverting back to an “inwash” endplate, pinching the profile of the ‘plate inwards and passing airflow inside of the front tyre rather than than around it like we currently see (via an “outwash” endplate curving outwards). The endplate is beyond halfway of the tyre tread so I would assume that it is still slightly more efficient to produce an outwash endplate. Teams will want to continue with this design as they have been using it since 2009 (when the current regulations came in), so the car’s aerodynamic philosophy will be based around the aerostructures of the outwash endplate. Major revisions to the chassis height have been made. Previously, the chassis height remained constant at 625mm above the reference plane, from the cockpit to the front bulkhead (just beyond the front axle line). 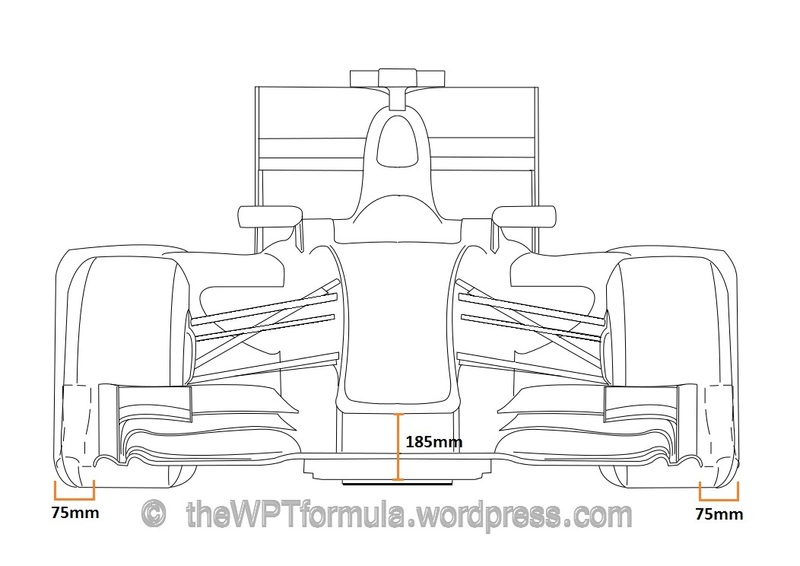 For 2014, the maximum chassis height remains at 625mm but the front bulkhead height must be 525mm before then dropping to the nose, 185mm above the reference plane. This sudden drop means that vanity panels are still allowed next year although this brings a small weight penalty. More on this further on. 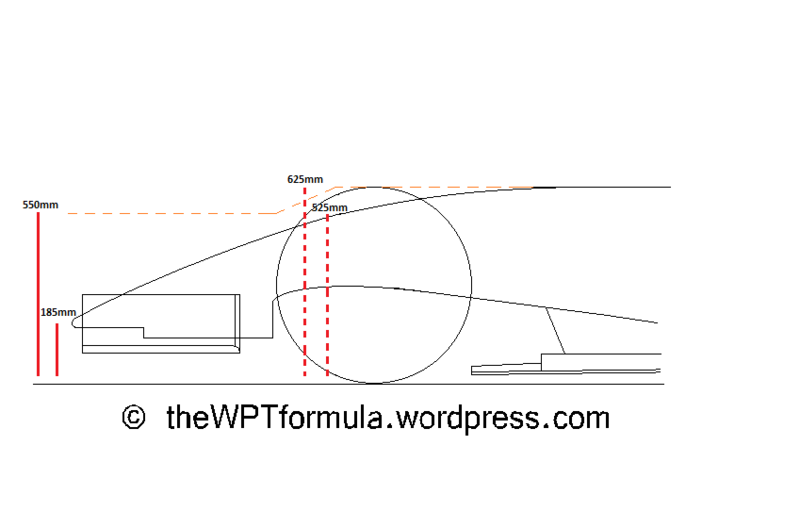 The nose height has been reduced from 550mm to just 185mm above the reference plane (the reference plane on an F1 car is the lowest part of the floor that the plank attaches to). The reduction in height will also reduce the volume of airflow passing to T-Tray/splitter section immediately behind and therefore reducing overall downforce. Teams have been exploiting a high nose to force air under the car and accelerate the flow through the diffuser. From a point 50mm behind the tip of the nose, a cross sectional area of at least 9000mm² must run up to a point 250mm above the reference plane, which is in line with the base of the front bulkhead. To put this into context, this area is about the size of a 53mm radius circle… tiny! Journalists have recently reported that engineers are worried about the look of these designs, with Craig Scarborough recently drawing his interpretation of next year’s noses on autosport.com. The reason why teams may choose to design a nose this way is to feed more airflow beneath the chassis and enhance the aerodynamic performance of the underfloor. We have seen over the past few years that raising the nose as high as possible generates more downforce at the rear of the car as a greater volume of airflow is travelling beneath the chassis, into the floor area below and extracting performance from the diffuser. After this mandatory section of bodywork, the teams can then do whatever they want with the nose up until it meets the front bulkhead line. This means that the narrow section could feed into a very wide area of bodywork as shown in the drawing in the article from the link above. This effectively replicates a high nose but with a thin section added to the front, as this is mandatory. The thin design opens up space for airflow to pass beneath and below the chassis which is exactly the same process that happens with the current generation of noses. Aerodynamically teams will want to find the best solution but it is not that simple. Passing the crash tests will be extremely difficult as the narrow section feeds into a much thicker section just before the front bulkhead. Ultimately then you would have to expect the top teams to produce the tidiest versions: these teams will have more money to spend on varying carbon fibre layups and make the best compromise between performance and function (ie passing the crash test). We could still see some elegant designs as the regulations do allow for wide noses at the tip. This is unlikely, however, as they will probably want to extract more performance from the underside of the car. 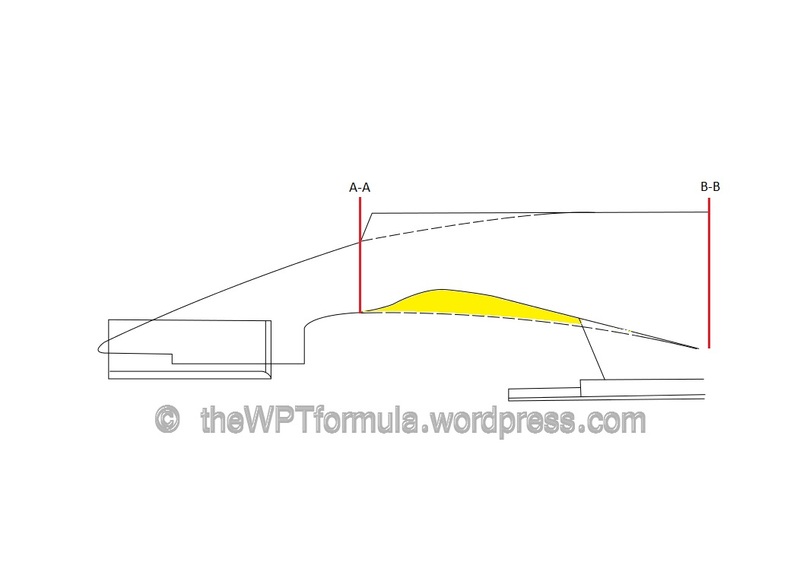 Here is a diagram that should give you a rough idea of what next year’s nose layout will look like. 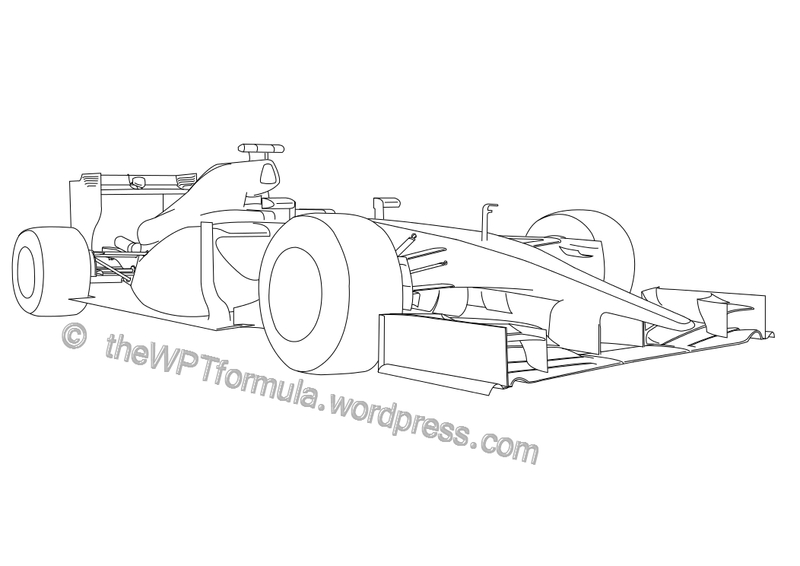 You can see that the maximum chassis height remains the same but then it drops to 100mm lower at the front bulkhead. The orange dotted line indicates the current maximum height limits, with 550mm being the highest the nose can reach. You can also see the stepped region. There is clearly a dramatic difference between the height of the 2014 nose compared to the 2013 nose. 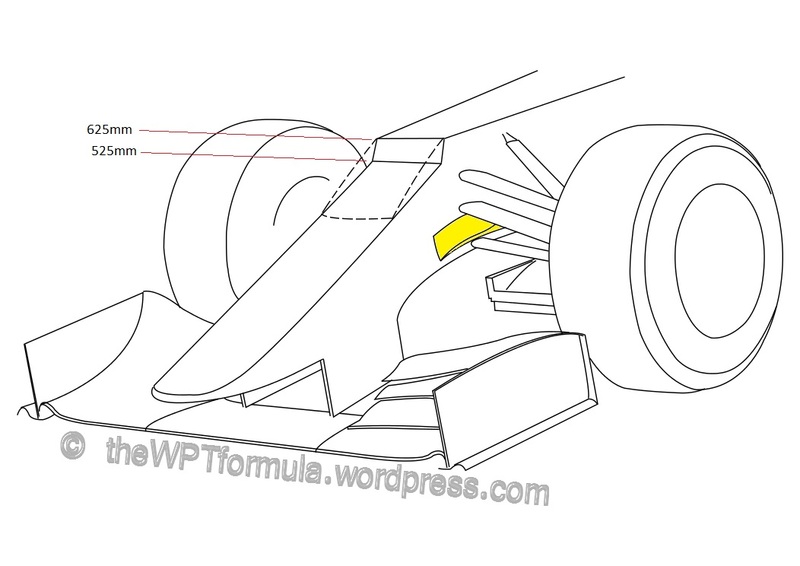 In the image above the drop between the top of the chassis and the nose is quite progressive, but teams may decide to have the chassis height at 625mm right up to just before the front bulkhead line before suddenly dropping to the nose section. This will free up space beneath the car to control airflow going to the splitter and bargeboards, as the bottom of the front bulkhead will be much higher up as a result. This option may not be as appealing as it has been over recent years as the low nose height restricts the ability to introduce a large volume of air beneath the chassis. If teams can find a way of flowing the air around the nose and then beneath the chassis this could maximise the additional space that comes with implementing a high front bulkhead. Most teams have been placing their mandatory TV camera pods in areas that produce an aerodynamic advantage, such as immediately behind the front wing main plane between the pillar mounts. This will not be achievable in 2014 as all camera pods must be placed between 325mm and 525mm above the reference plane. The above image is an idea that I have produced showing one possibility of what might be on show next year. 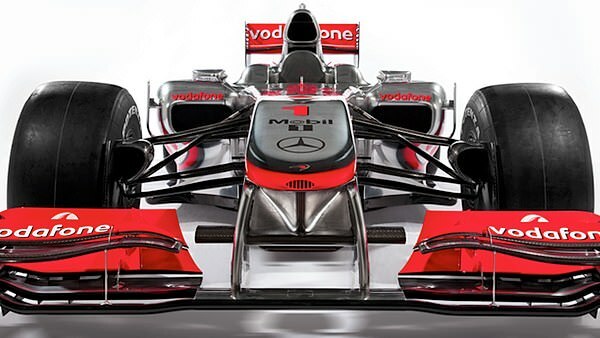 In this image we can see why some engineers and designers are claiming that next year’s nose could be the ugliest yet. There is a sharp step along the chassis before the nosecone section begins. As stated above, the maximum chassis height is the current 625mm and the front bulkhead height must be a maximum of 525mm. Over the past few years, opening up the underside of the chassis has been a useful way of providing more downforce to the car as a greater volume of airflow reaches the splitter section which in turn produces good front and, more importantly, rear grip. With this in mind the teams would like to keep the underside of the chassis as high up as possible to attempt to revisit this common practise. However, with the nose of the car so low then it is very difficult to plug the underside of the chassis with airflow. This is why I have tried to be a bit creative and come up with something (that probably doesn’t work but I thought it was worth a go…). We can now see clearly the dimensions of the chassis height and why the regulations cause this problem. The dashed line represents a vanity panel (still permitted for 2014) that can cover the step if necessary. The highlighted section by the lower wishbone is an idea that I have come up with to tempt airflow from around the nosecone to beneath the chassis. McLaren introduced a “snow plough” beneath the nosecone of their MP4-25 (in 2010) to feed airflow from beneath the nose to outside and around the chassis. In the case above I have effectively swapped it over, with the pointed section of the “plough” now facing backwards and towards the underside of the chassis. What I have tried to achieve here is to implement an encouraging area of bodywork that allows previously normal airflow around the nosecone to make its way beneath the chassis and therefore create a slight aerodynamic advantage. This solution would be no where near as effective as the current high noses and chassis but it could supplement the problem slightly. Alternatively, teams could just opt for a lower chassis and nose to improve Centre of Gravity as they may not see an aerodynamic benefit of raising the chassis. The yellow area in the above image highlights the potential that a higher chassis layout could bring. There is quite a significant gain in volume although whether this can be exploited is another matter. Another stumbling block about this design is whether it will pass crash testing as its shape is rather irregular on the underside. 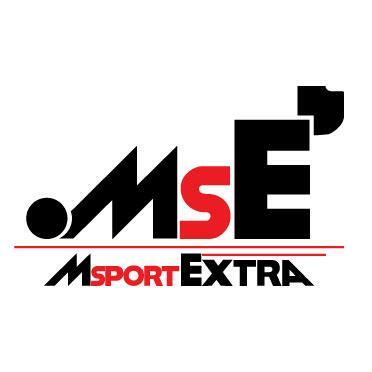 Note: I will update this page regularly as new information comes in.